There’s a new McDonald’s in town— in Tiger Town, actually, built to the same Starbucks-esque specifications met in renovations completed this week at the area’s four existing Golden Arches. 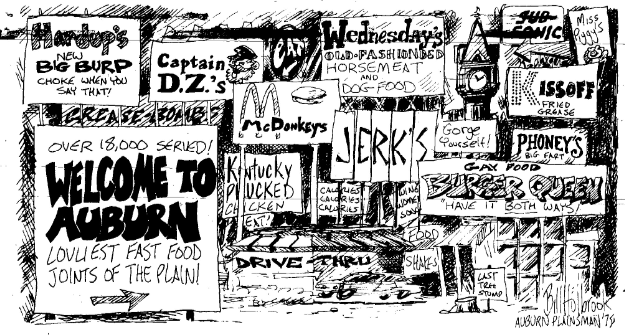 But we don’t even think being the swankiest McDonald’s market in the country would have kept Bill Holbrook, one of Auburn’s most notable alumni cartoonists, from inking his less-than-P.C. 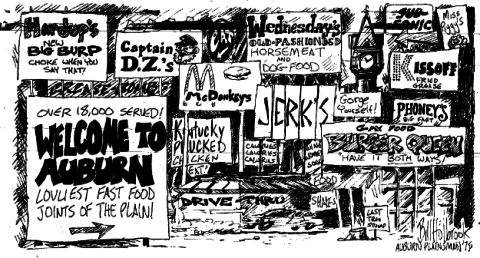 wrath on Auburn’s embrace of the fast food industry in The Plainsman, like he did during the McGlut of 1978 [click to enlarge]. We’ll be exploring Holbrook’s extensive college catalog of Auburn commentary in the coming months. In the meantime, I so hope the one on Magnolia is still serving breakfast.